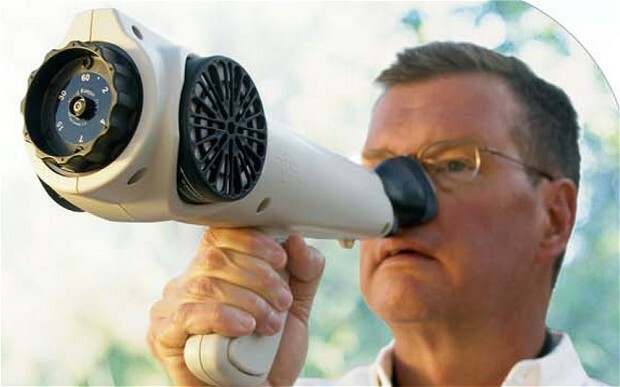 'Nose Telescope' Lets Cops Figure Out How Much Cannabis Is In The Air | OhGizmo! While an increasing number of cities across the US have stated allowing the recreational use of marijuana, some of them, like Denver, have also passed some peculiar laws in the wake of the legalization. In particular, in Denver, you can be fined up to $2,000 if it’s found that you have “polluted the atmosphere” with the smell of your grass. Yes, it seems concern over the city being overwhelmed with the skunky smell of pot was enough to prompt the passing of this law, and even though you’ll be allowed to smoke in the privacy of your home, your neighbours better not get a whiff. So, the police will be using a device like the one pictured above to determine if you’ve exceeded the, uh, pollution limit. The thing is called the Nasal Ranger Field Olfactometer and the the threshold for an offence is apparently if “the odour is detectable when the smoke is mixed with seven times the volume of clean air”. It’s a little ridiculous looking, for sure, but if you guys see the police outside your house with this thing on their faces, at least you know what they’re up to.